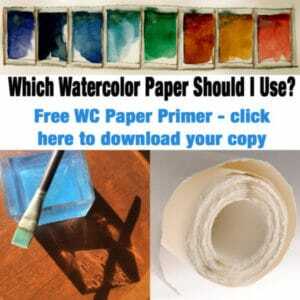 Watercolor – Bunny’s Tutor – and What’s the Best Size for Paintings? How have you decided on the size of your work? I have been trying to enter some watercolor competitions… It seems that larger works are the norm. Why have you made the decision to go smaller with your work? Do you find that it sells better? Is it more fun for you because it’s quicker or more manageable? Do you sometimes do larger work (printmaking or watercolor)? Thanks for the great question, Marie! Have any of you wondered about sizing your artwork? Do you work large, small or right in between? What are the pros and cons of each? Brew some tea and pull up a chair, and let’s unpack this question a little bit. Get 20% off every painting and all printmaking in my Etsy Shop for 72 hours starting Friday, Nov 25th. Use coupon Code BLACKFRIDAY18 (click here to have a look). What’s the best size for paintings? An exhibit at the Weisman Museum at Pepperdine College with large work from Artist members of the California Art Club above, and under that, a 6×6 inch small works show at Randy Higbee Gallery. If you’re thinking about submitting work to a regional show in your town, consider the exhibit space when selecting art you’ll submit for the show. Will the exhibition will be hung in a series of connected, meandering rooms and hallways like those in a public library? Perhaps submit smaller work, with high contrast, and readable values, in case the lighting isn’t optimized for gallery shows. Is the exhibit in a broad, open room with skylights and bright lighting? Maybe submit your biggest work, and imagery that reads well at a greater distance. Have you looked at your work outside your studio? Take your pieces outdoors, and to the largest room in your home, or your garage. Observe your artwork from a variety of distances. How does it read from far away? And how does it look in different light? Viewing proximity has a big affect on a painting’s impact. It’s a good thing to ponder as you’re walking to and from your work surface, squinting all the while, to be sure your art reads well at both close up and far off while it’s in process. On the couch the next day: a lap desk, a small watercolor palette, a paint brush, a cup of water and a paper towel in the other hand. And some music. On your mark, get set, GO! What’s the Best Size for Paintings? You’ve probably already surmised that the answer is all of them. Curators will look for art that fits the theme, and the size, lighting and distance of the walls where the show will be hosted. An art collector will search for a very particular width and height of art for an empty wall, or in reverse, launch a rapid-fire mental survey of their rooms to justify the purchase of a piece of your art they’ve fallen in love with. 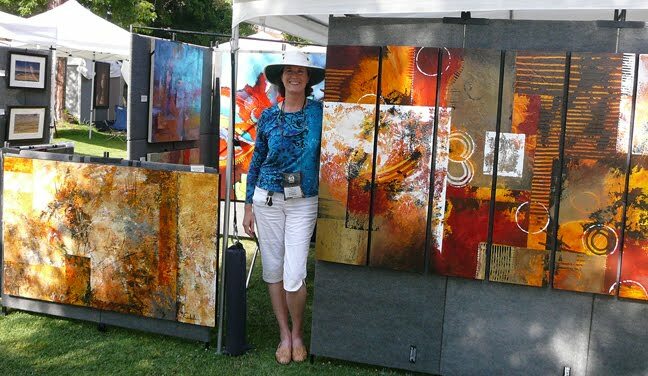 When I participate in art festivals, the location has an impact on the size of the art I bring to the show. In San Diego, Little Italy is full of adorable little 1920’s bungalows, uphill from glass skyscrapers with ocean views all around. The folks in the bungalows have niches, and smaller rooms with crown moulding and wide door and window trim wrestling for wall space. The people in the skyscrapers have paid for views and walls made from glass, so they have solid internal walls, but not many of them. In addition to selecting subjects for the region, I’ll also pack smaller art, and more verticals for narrow interior walls. So, make art in all sorts of sizes to match the rooms and occasions of its potential exhibition space. And in your experiments with art size, pay attention to the formats (small, large, rectangular, square, circular, etc.) you have the most fun with. Does that make sense to you? Why Do I Paint Small? If exhibits and festivals and collectors weren’t part of my art-making equation, I would paint small all the time. It’s a natural, comfortable, familiar format to me, and there are a pile of other pluses to making small art. If the painting you’re working on is small – 11×14 inches instead of 4×6 feet (my friend Nancy Eckels paint large) – you finish more often. If you’re the type of human who feels encouraged by a sense of accomplishment, work small to ride the accomplishment into another start. Planning to offer your work for sale online? Shipping small is wayyy easier than boxing, crating via freight. And it’s less costly. Then, there is storage of the art. (We talked about that here.) Small art is also wonderful if you like to paint in un-painty spaces, like me – on the couch, at the kitchen counter, at the firepit table on our deck, etc. Making small art and keeping all the gear needed to paint it in a tote bag means I have a mobile studio to carry willy nilly into every room in the house. Do you paint small? P.S. Get 20% off every painting and all printmaking in my Etsy Shop for 72 hours starting Friday, Nov 25th. Use coupon Code BLACKFRIDAY18 (click here to have a look). Click the kitty to visit Belindatips, and sign up for the free mini course to get to your art supplies more often. One of the great cruelties and great glories of creative work is the wild discrepancy of timelines between vision and execution. When we dream up a project, we invariably underestimate the amount of time and effort required to make it a reality. Rather than a cognitive bug, perhaps this is the supreme coping mechanism of the creative mind – if we could see clearly the toil ahead at the outset of any creative endeavor, we might be too dispirited to begin, too reluctant to gamble between the heroic and the foolish, too paralyzed to walk the long and tenuous tightrope of hope and fear by which any worthwhile destination is reached. 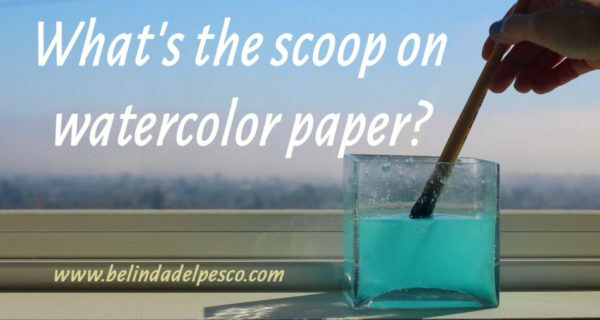 8 Responses to Watercolor – Bunny’s Tutor – and What’s the Best Size for Paintings? Thank you for the quick reply-post! I learn so much from you and your perspective! I’ve been trying large (full sheet watercolor paper), but I am not really enjoying it. I think in the future I may go no larger than half-sheet size, though I am glad I gave a good attempt at the larger size. I also had not thought about smaller bungalows and high rises needing art for smaller wall space. That makes perfect sense! If I ever finish my current large painting, I’m going to follow your example and spend some time painting small(er). Happy Thanksgiving! I’ll be doing a show of B&W photos in June at a local business. They’ve had exhibits there for three years, so I’ve had time to learn what catches my eye and how the room works. BIG pieces that grab your attention from 40 feet away is the first consideration. The second is that there are lunch tables along the exhibit wall, so details need to be readable from a few feet away. I’ll be making large prints. Large w/c paintings have intimidated me, but I’m trying to work with large color fields broken up by small details. I have trouble with scaling things in so many ways! Kirsten, Your Show sounds terrific. And it sounds like you have a solid plan in your exhibition layout. 👍🏼 It’s helpful to think in categories when surveying your art: Distance pieces vs Close Proximity pieces. What looks best from a distance? Usually larger work, with values and/or shapes that read from across the room. Close proximity pieces are usually mid-size to small, with details that reward closer inspection. Armed with that and your experiences seeing previous shows in that space, your exhibit will be fantastic! I am thankful for you, Belinda, for freely sharing your experience, talent and inspiration. I so enjoy your blog. I like your confidence in that you have found the painting size for you but hold no judgment toward other choices. I have never thought about painting large or small depending on the venue. I had read that artists with small studios usually paint small and vice versa. That is true for me in my small space so doing something large for a show is uncomfortable. I’m getting to the age of seeking comfort and painting for myself. Take it or leave it. Hi Donna, Thanks for your compliments. I wholeheartedly agree with your pursuit of comfort in the size and format of your paintings. The process can be vexing enough as is, especially when squeezed into a busy life. Each little discovery of something that works in our set up helps shore up a solid foundation – and that’s the safe platform we draft courage on – to experiment with new art, push our skills to new levels. Yayy to seeking comfort, and painting for oneself. Take it! Are you trying to get back to making art? Wondering how to fit creative time into a busy schedule? I let my art supplies collect dust for decades, and now I'm painting and printmaking full time. Let me help you figure out how to get more art-making into your life. Need an Art Studio Flow Chart? Wish you were making more art? © 2019 Belinda Del Pesco. All Rights Reserved.